I flicked through all the patterns in the book, and was immediately drawn to some beautiful cabled socks....then I checked back with reality and chose some more simple ones, which the book referred to as being good for a beginner....yep, that's me! I bought some regia yarn on line and being rather click happy, clicked on 'buy it' before I checked the colour box....oooops......this was maybe not my first choice, but hey ho, its sure to brighten someones day! Anyway, if you want to catch up with all the other sock knitters, pop on over to Sarah at Crafts from the Cwtch......I'm sure you'll see far more sock than you are seeing here! Thankyou for all your lovely comments last week....wow, you really are a lovely lot! Well done with your sample socks dearest Faith, I really admired your tenacity and bravery with your new found skill! 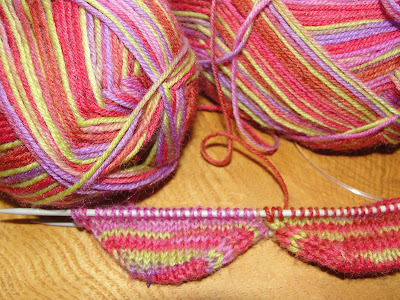 I think the Regia socks are going to be perfect for the Spring, such happy colours! Your sample socks look great Faith and I really like the yarn your using now, its so bright and cheery, I must keep it in mind for the children. I don't envy you the bother with the bt! I really like the sound of forced knitting time...now that I could totally get into ! very cute sample socks! I should have probably tackled those first before diving head into a pair of socks - but as I hate knitting gauge swatches I figured a sample sock would go the same route. The yarn is very pink and cheerful! How adorable are those sample socks!! I love the new socks too, they will be so pretty! You are doing an amazing job Faith. Beautiful socks. 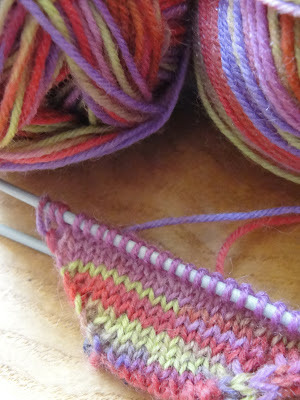 That new yarn is lovely - very pastel and spring-y and cheerful. And what an adorable pair those first ones made. So glad you got sorted with BT ... and why is it always Four Seasons? (Or Eine Kleine Nachtmusik?) And not even a full movement but an annoying choppy bit that keeps repeating - at least that's what we get over here. Thanks again for your comment on my blog - you always leave such nice ones. I'd never heard of EE Cummings and have just been on a very short internet expedition finding out some of his (her?) quotes, off to look for more as I like what I've seen so far, thanks for that! Those sample socks are brilliant!! And I think that new yarn is very cheerful. oops, that should say phone wars! What fun colors for this early spring we're supposed to have. Hooray for you on those sample socks. They are adorable for chubby lil' feet. 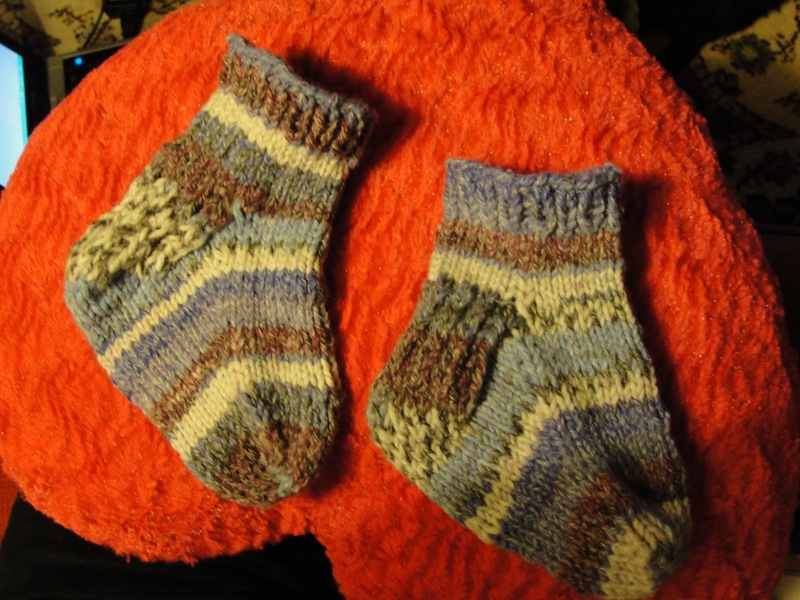 Happy Sunday to you Faith...Your socks look fab and I love the colours of your new yarn...there will be one pair of very Happy Feet!...Kitting out the entire family in one go sounds like very impressive stuff...Go Faith!